OK, I admit it, I never really watched Top Chef. All I knew about Stefan Richter was that he was the bald, cocky, European guy who was arguably the best cook on the show. Despite his skills though, Richter ended up, along with Carla Hall, as a mere runner-up to eventual winner Hosea Rosenberg (who's still at Jax Fish House in Boulder). 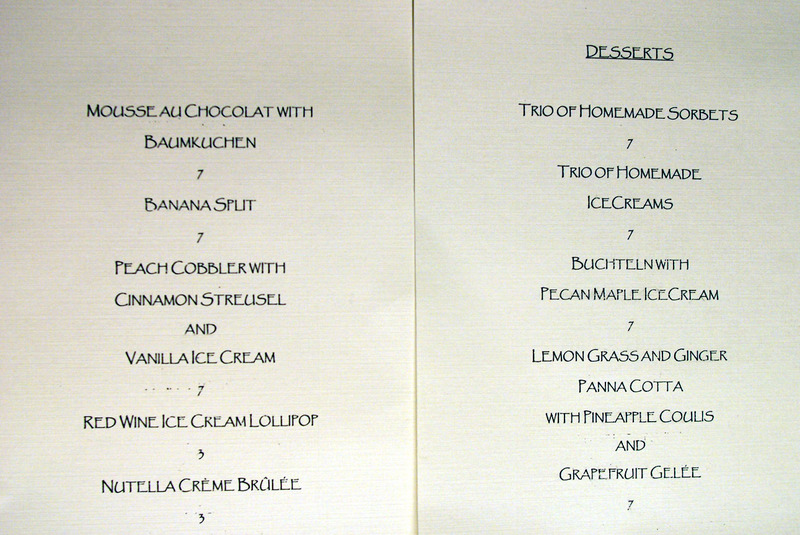 Prior to this meal, I thought that Richter was German, but it turns out that he's only half--the other part is Finnish. He was born in Tampere, Finland, but grew up in Germany, where he started studying the culinary arts during his teenage years. Richter worked at numerous kitchens throughout Europe (including the two-star restaurant of Landhotel Schlosswirtschaft in Illereichen, Germany), and eventually earned a Master's level culinary degree from Fachhochschule Würzburg-Schweinfurt in 1993. Richter subsequently made his way to the US, and held a number of positions around the country, even helming the kitchens of the Bellagio and Enoteca Drago. He then opened his own catering company, Stefan's European Catering, based out of Santa Monica. After his stint on Top Chef, Richter also started his own clothing line: Cocky Chef Clothing. This new restaurant at L.A. Farm, thus, represents the latest expansion of Richter's culinary empire. L.A. Farm was originally opened in 1989 by producer Alex Winitsky and partner Arlene Sellers, on the grounds of their $50 million Lantana Center entertainment media complex. The space quickly became a hub for entertainment power dining, serving up rustic California-inspired fare in a relaxed, semi-casual atmosphere. 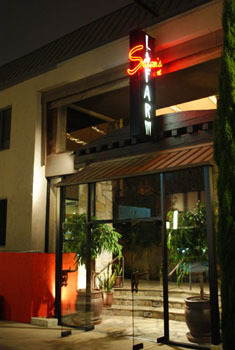 According to Richter, the physical transformation from L.A. Farm to Stefan's at L.A. Farm was completed in only about a month. In fact, the place opened up so quickly that Richter was able to win a $5,000 bet with Top Chef Season 2 winner Ilan Hall hinging on who's restaurant would open first (Hall's restaurant in Downtown, The Gorbals, is set to open soon, but not soon enough). Above, we see the restaurant's main dining room; apparently, Richter purchased all the furniture before the site was even secured. Perhaps more interesting is the patio, replete with fire pit. There's also a bar area and a private wine cellar with room for 20. 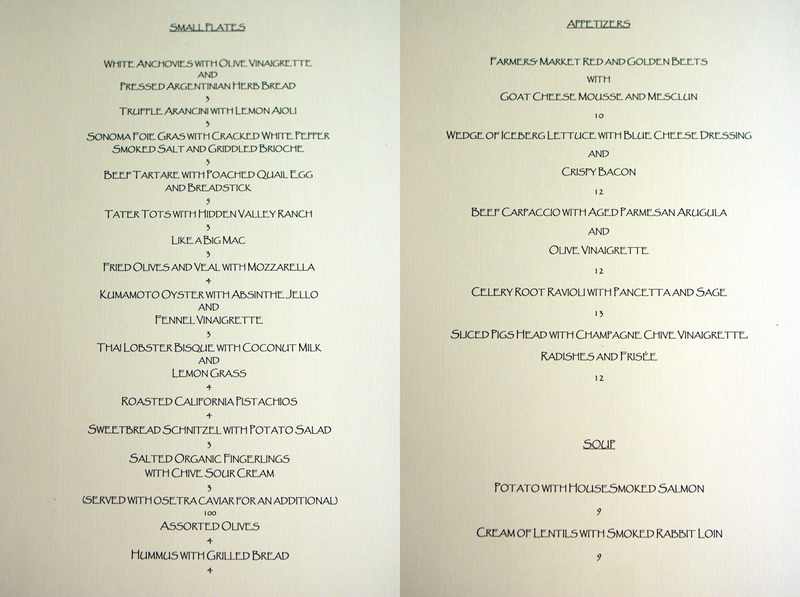 Here we have Stefan's menu, split by small plates, appetizers, and mains; click for larger versions. The most interesting items are found in the small plates selection--I mean, who can resist something called "Like a Big Mac?" 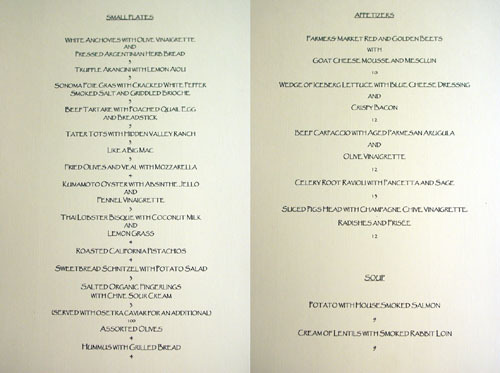 A word of warning though, small plates really does mean small in this case (as we'll see below). 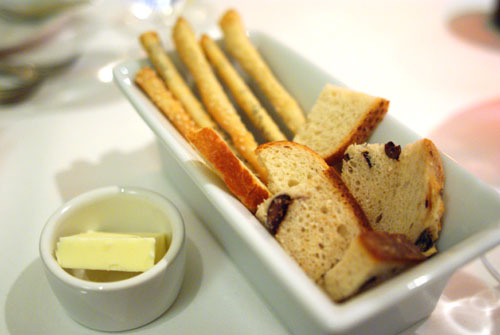 Bread service consisted of olive bread and two types of grissini: sesame and poppy seed. 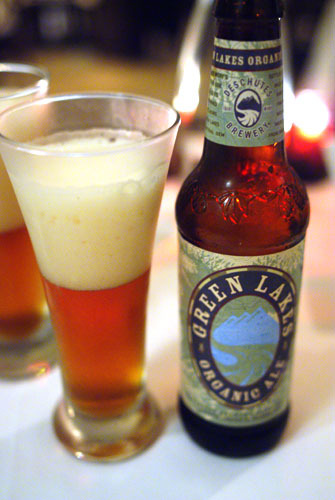 We decided to start things off with some beer from the Farm's short selection: Eel River Brewing's Certified Organic Porter [$6] and Deschutes Brewery's Green Lakes Organic Ale [$6]. For you hipsters out there, PBR is also offered, along with Richter's favorite, Milwaukee's Best (a.k.a. "Beast"). 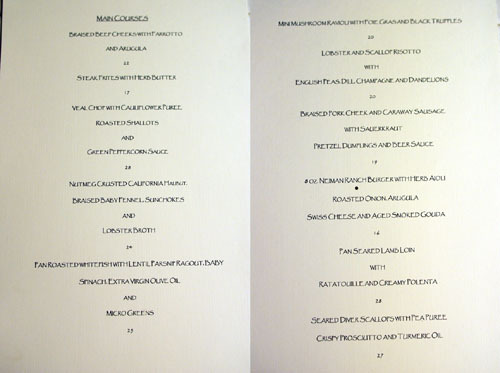 In addition, an abbreviated wine list is available, and we followed up the brewskies with a duo of 2007 Chardonnay: Napa Cellars [$8] and Coppola's Votre Sante [$12]. When most Americans hear the term schnitzel, we tend to think of the infamous hot dogs of fast food chain Wienerschnitzel (which, ironically, doesn't actually serve its eponymous dish). A schnitzel is, in reality, a breaded and fried meat cutlet, and Richter's version substitutes sweetbreads for the traditional fillings of veal, pork, or chicken. 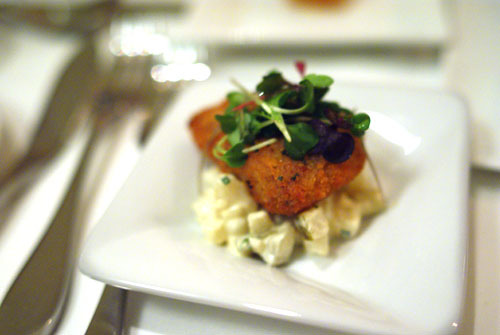 The sweetbread was firm, dense, with a mild initial flavor leading to a richer, gamier finish. The tart, tangy potato salad, thus, was a superb complement, effectively cutting the considerable gravity of the schnitzel. My favorite item of the night. A dish of Italian origins, an arancino is a rice ball, typically filled with a meat ragù and mozzarella cheese, that's been breaded and fried. Richter's take adds shaved truffle into the mix. The result is a delicious cube of creamy, cheesy rice, though the truffle essence could've been more pronounced. Texture-wise, the crisp, crunchy exterior was a fitting foil to the creamy insides, and I enjoyed the tartness of the lemon in tempering the arancino's weight. 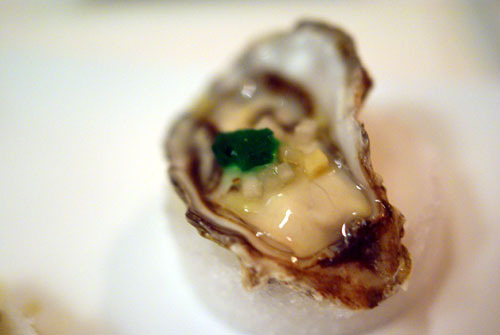 Kumamotos are my favorite variety of oyster, and here again, I loved its crisp, clean, briny sweetness and snappy consistency. The use of absinthe and fennel added an extremely subtle anise tinge to the bivalve, but I wish that flavor would've been more manifest. 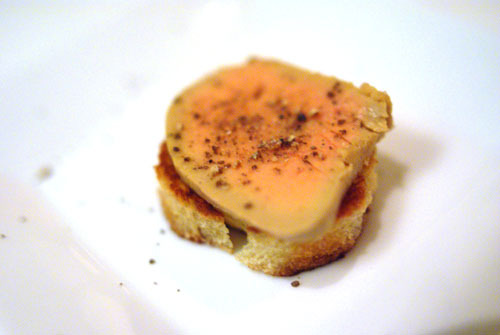 The foie actually turned out much nicer than I'd expected, with the salt and pepper proving to be a great accent to the flavor of the liver. Meanwhile, the brioche really tempered the foie, mitigating its intensity while giving the dish a bready finish and lovely complexion. Very good. With such a provocative nomenclature (and being a fan of the ubiquitous sandwich), how could I not order this? This was like a mini-mini-burger, a half-slider, a one-bite wonder (though it wasn't the smallest I've had). It was filled with a beef patty, a Swiss-like cheese, red onion, caramelized onion, and some sort of green vegetable (lettuce? arugula?). At first, I thought that the burger was tasty, though not particularly similar to a Big Mac; it was only on the finish that the resemblance made itself known to me. I would say that the beef could've been done rarer though. 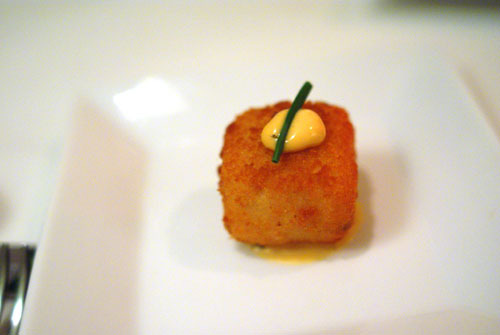 Tater Tots were a favorite of mine during my adolescence, when I would fare them regularly at the school cafeteria. 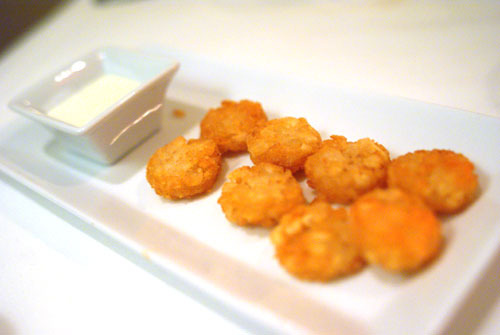 The Tots here, done extra crunchy, thus made for a somewhat nostalgic eating experience. As for the rationale behind the sauce, Richter mentioned that Hidden Valley Ranch was a staple of his when he first came to the US. Amazing, the dipping sauce actually uses real Hidden Valley Ranch (notice that the phrase is not quoted)! A simple but satisfying dish, with the tanginess of the ranch offsetting the monolithal potato nicely. 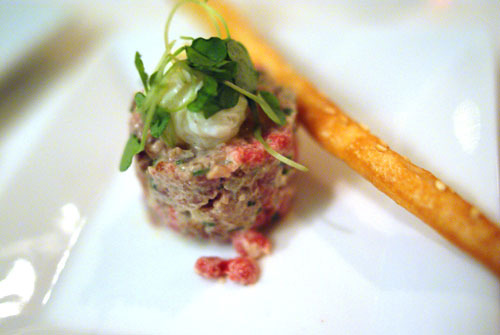 Our final taste of the small plates spread was this tartare (I have a hard time not ordering tartare if it's on the menu). This was certainly a nice example--lightly flavored meat, a tinge of mustard, a bit of creaminess from the egg, bracing greens, and a subtly acerbic finish. I would've liked to have seen a different breadstick though, as it was identical to the ones in our bread basket. 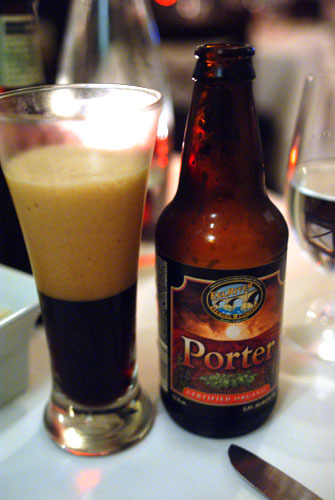 Now, a singular dish from the appetizer selection. Think of this as head cheese, basically a cold cut made with pork cheek and other ingredients in an aspic-like gelatin. It had a marked saltiness, with a pleasing tanginess thanks in part to the vinaigrette, and the radishes and frisée worked well in balancing the meat. However, I would've preferred thicker slices, to better appreciate the texture and flavor of the head, though Richter later advised against this, saying that the resulting dish would be too rubbery. As I've mentioned before, if risotto's on offer, then I pretty much have to order it. This was a solid example, with rice that was near al dente--creamy, yet still with some bite--it was slightly too soupy however. Flavor-wise, the initial attack was quite rich, cheesy in fact, while the peas came into the fore on the midpalate, balancing things out with their vegetal tang. 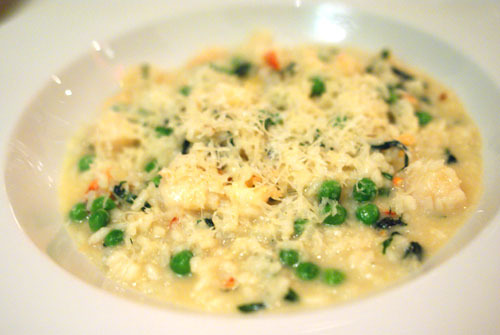 The seafood, meanwhile, gave the risotto an enjoyable, briny finish. An unabashed nod to Richter's Germanic heritage, this next dish is also among the most oft ordered, at least according to our Kurdistani server Furkat. The pork itself was braised to a tender, but still somewhat firm texture. My dining companion thought it overly tough and dry, but I appreciated the bit of bite that it still had. My favorite element here, though, was the housemade sausage. I'm a big fan of cased meat, and this was a particularly fine example, with a fantastic sweet-spicy interplay and rich flavor. 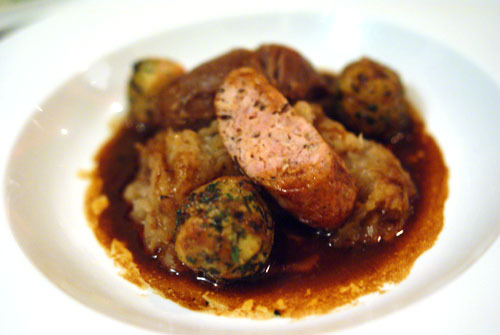 The dumplings (klöße or knödel), made from pretzel bread, were also quite enjoyable. Finally, the acidic sauerkraut went a long way in balancing the heft of all the other elements here, though I would've liked the cabbage a bit crisper. We were pretty much ready for dessert at this point, but decided to order this last savory for the hell of it (deciding between it and the veal chop, actually). 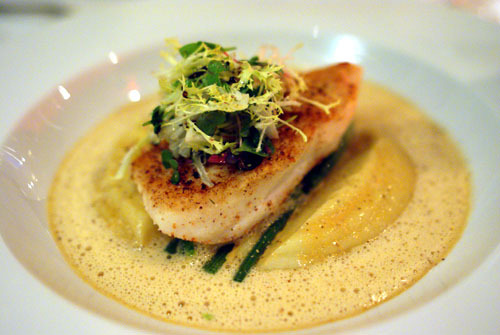 The main issue we had with this dish was that the nutmeg crust was too thick, too tough, thus taking attention away from the actual flesh of the halibut, which was indeed quite delicious. I would've also appreciated a thinner broth, with a more delicate application of lobster essence. Though my dining companion would disagree with me on this point, I enjoyed the use of fennel here, which provided a lightening vegetal foil to an otherwise hearty dish. Of course, I almost always save room for dessert. Click for a larger version. 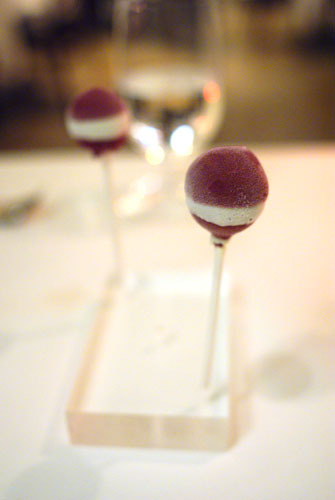 Though these lollipops recalled those from Providence in appearance, they were a completely different animal. Rather than getting an explosive burst of liquid upon mastication, you first get a tart, creamy exterior imbued with the essence of red wine, which then leads to a crunchy, chocolatey center. Great fun. 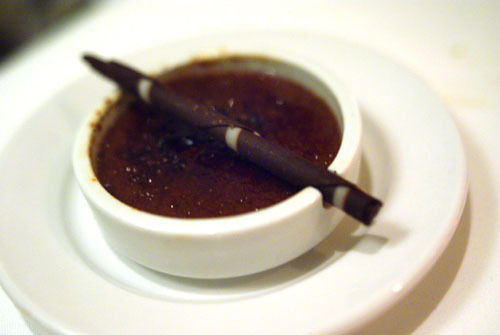 Nutella and crème brûlée--it'd be pretty hard to go wrong with this combination. And indeed, this was a tasty little morsel, nutty, yet chocolatey; think crème brûlée, but one that tastes like Ferrero Rocher (or gianduja, according to my dining companion). The whole presentation is reminiscent of a cigarette and ash tray, no? Richter is a smoker after all. A baumkuchen ("tree cake") is a kind of layered cake traditionally made by brushing layers of batter on a cake rotating on a spit. Since LA Farm lacks such a contraption, the version here is made by layering horizontal strata of batter in a baking pan. 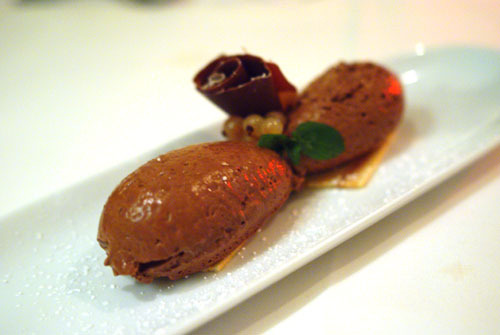 In any case, it came sliced very thin and topped with chocolate mousse. The mousse itself was quite appetizing, and the cake provided a nice moderating contrast to the sugariness of the cream. However, I would've preferred a more substantial portion of the baumkuchen. It seems like Richter has done a fine job in revamping the old LA Farm. His cuisine certainly draws upon his Continental roots, but is intentionally eclectic, and still influenced by the Farm's Californian roots to be sure. The menu is bold, brash, reflecting the Chef's somewhat larger-than-life persona; Richter's still tweaking it, adding and dropping items, hopefully refining things based on early feedback, so it might be fun to revisit the place once things have settled down. Stefan's is a welcome addition to the Westside, and though Richter didn't prevail on Top Chef, perhaps he may just have an even bigger prize here on the Farm. Fantastic review. The "ash tray and cigarette" crème brûlée is very unique and fits Stefan's style. 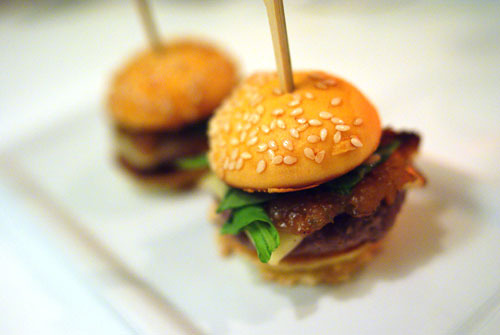 And the mini Big Mac, such a a tiny burger; would it have worked better with a more substantial patty? 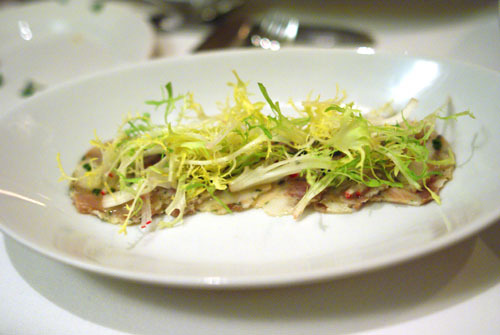 As for the sliced pig head, it looks like the frisée balanced the taste of the meat, but maybe overpowered it in texture and proportion? Great pics as always...I need to start bringing my DSLR to my reviews and just ignore the gawkers. good eats, but i'm a little miffed with the baumkuchen. it's one of my favorite cakes, and the whole fun of eating it is peeling one layer off at a time! Paying three dollars for eight tater tots seems kinda cuckoo. What made them any different from what I could get from Ralph's freezer section? Burgers, Foie Gras, Truffles AND Tater Tots on one menu? LOVE IT. And your photos are getting better (if that's even possible). I have been wanting to go, and now I want to go this weekend. Ila: Yeah, we were a bit miffed (love that word) as well! The key to baumkuchen is the layers, so it would've been nice if that aspect had been better accentuated. Jo: Given what a Top Chef fiend you are, I'm surprised you haven't made it over here yet! Matt: Matt, I read your post on The Gorbals today. Is it worth going back to? Liz: Are you going to make it over this weekend? It'll be interesting to see your take on it. i love the way your fotos turned out. this makes me want to go back and eat these things. Stefan is certainly a great chef and the food is really fine. However, no one commented on the fabulous fine art by artist Michael Maddox adorning all the walls. wow you can take pics there? i heard stefan isn't too fond of food bloggers. In this day and age, I think he's learned to deal with it. I don't think he wants to antagonize what could be his more ardent followers. Hey Shelley, I've actually already been to LudoBites. See here. Plus, I'll be going tomorrow as well. Have you been? Hi Kevin, I used to be a big fan of your entries. I still enjoy reading them because you get to explore and enjoy different foods and it's nice that you're sharing it with us, but by the way you write.. I have noticed your attitude changing. In other words, full of yourself. It sounds mean but as a loyal reader I just wanted to give you my 2 cents. I don't know if it's because you know more about food but it's getting a bit cocky and annoying that I just look at the pictures. Can you provide some examples to illustrate your point?